← Are you buying an iPhone? If you are in the market for a Wireless Router, you might be in luck. I just ordered this today and will be using this to track my shipment. 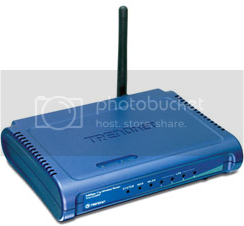 Buy.com has a TRENDnet TEW-432BRP – 54Mbps 802.11g Wireless Firewall Router for $9.99 after a $30.00 mail in rebate. If you open a new Google Account and use Google Checkout, you can get $10.00 off which means you get this literally for free and with free budget shipping. Now, I call that a sweet deal. You have to purchase this before June 25, 2007 to get this deal. The reviews for it are pretty good as well, so for the price I’m going to give it a try. Would you? Thats pretty cool. I have a Linksys wireless router and it works great… so I won’t be in the market anytime soon… But this is a great heads up on looking for deals like this one. Nice work!